Located another 1894 Newspaper ad (right most ad) relating to the Pantheon Saloon, James Dodd, and Enterprise Brewing Company. 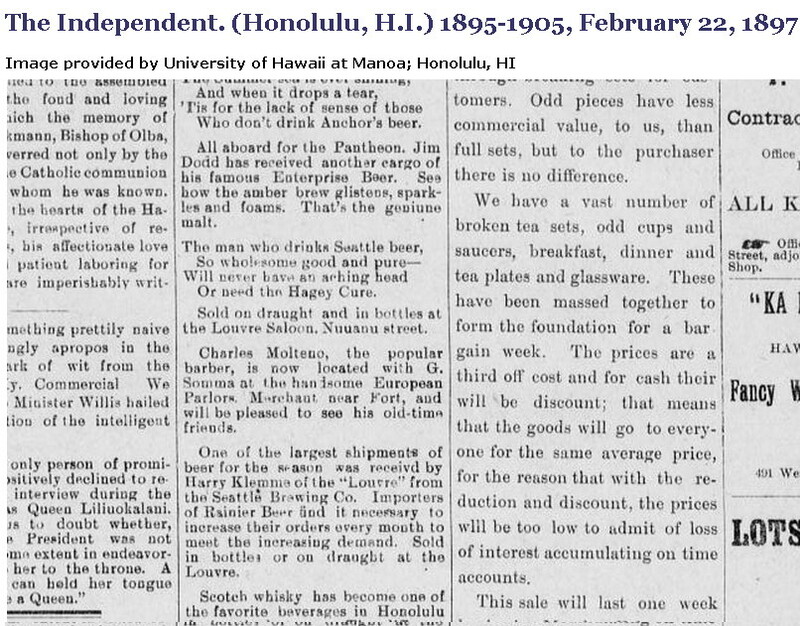 The ad uses the exact words as on the token: Enterprise Brewing Co.
One of the interesting aspects of Hawaiiana numismatics is the cross-listing of Hawaiian items with other areas of numismatics. In this case here the so called dollars (HK identifiers listed) specialty area. This provides a broader base of buyers when you sell your Hawaiian collection. Images to be provided in a future blog entry. Medcalf & Russell 2TS-21. I’m still trying to pin point the date of this token I believe I have done so. I place it in use in 1893. On my previous blogs I identified the start year of the Pantheon Saloon as 1881. 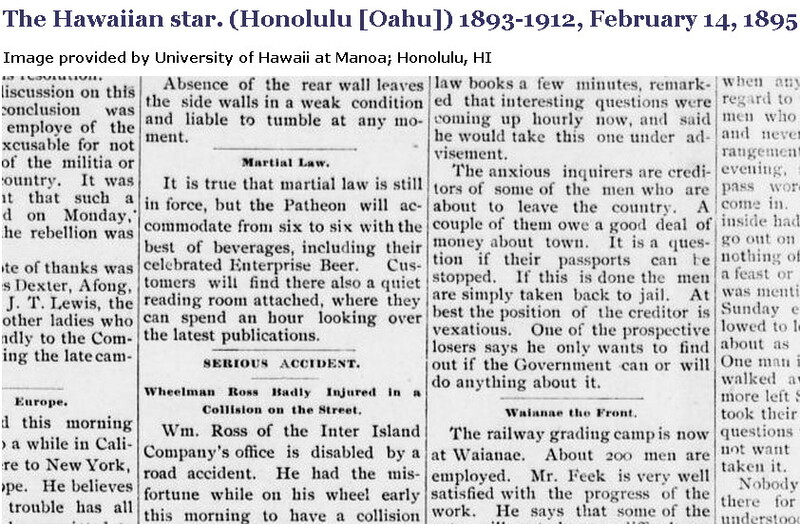 Attached are news clipping from the University of Hawaii at Manoa (nice trip to Hawaii, in thought, not body). 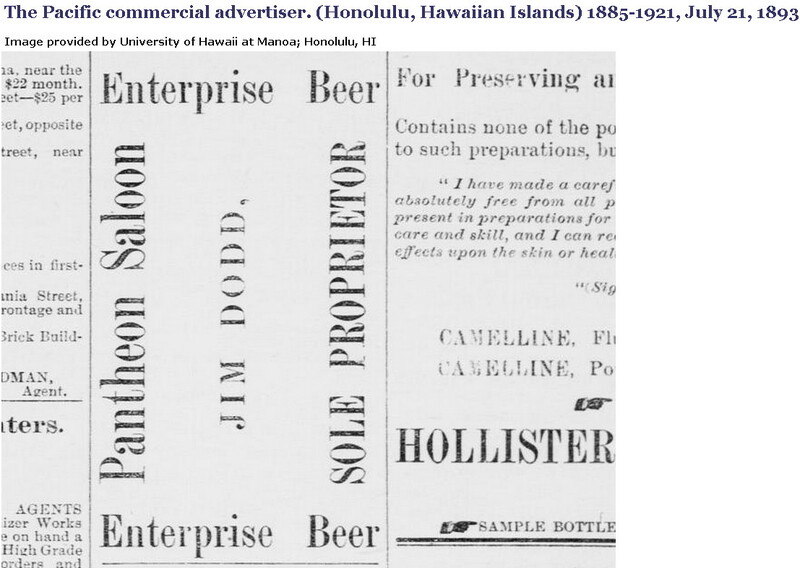 As you can see in the image below July 21, 1893 ad ties in three elements: James Dodd, Pantheon Saloon, and Enterprise Beer. Brewer collectors have assigned the CA 318 identifier to brand name “Enterprise Beer”. The years align with the 1893 date from the news clipping above. 2TS-21 identifies the token makers as C.A. Klinkner & Co. S.F. Which stands for Charles Alexander Klinkner of San Francisco. (Still researching this individual along with his company). Below is an 1895 newspaper clipping (I see it as funny as martial law declared, but you can still visit the Pantheon). 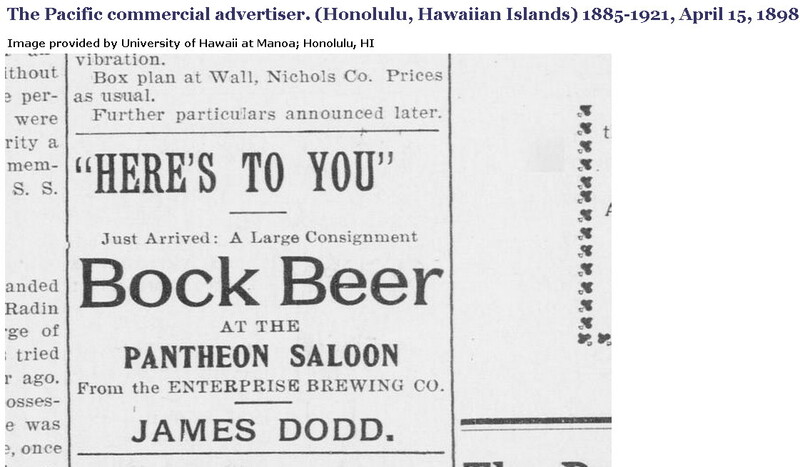 Then in 1897, Mr. Dodd still was selling Enterprise Beer. However, if you read further, Scotch whisky became more popular. Then in 1898, Bock beer from Enterprise Brewing Co just arrived at the Pantheon. I was reviewing the two letters of provenance that was provided to me by Pressed Metal Products. I purchased a total of 20 “working sample” medals from their in-house archive earlier in 2014 (search my blog for the term “Maui Coin Club”). These medal are not regular issue. They were struck with the original order and kept in the in-house archive of Pressed Metal Products. These are rather unique medals and definitely one of a kind Hawaiiana collectables (even more valuable with the letters of provenance from Pressed Metal Products, the original designer and minter of these medals). Here are online “working samples” from Pressed Metal Products. These working samples were also used to allow potential customers to see the previous completed medals that were design and struck by the by the company. The point of this blog entry is to point out an error in one of the letter of provenance and reveal new information to the public. The term Hawaii Coin Club is mistakenly used to identify Hawaii State Numismatic Association (HSNA) in the letter of provenance. What this means is that I have in my collection 6 medals that were created and designed for HSNA by Pressed Metal Products. From an investigative perspective, several of the HSNA medals were produced by Pressed Metal Products. This fact is not mentioned in the 1991 Medcalf & Russell book. The minting characteristics between the Maui Coin Club and HSNA medals are similar. I purchased the medals as excess inventory from the in-house archive of Pressed Metal Products. This was a chance of a lifetime to acquire these medals. No one else can lay claim (and provide written evidence) that they have original working samples of Maui Coin Club and HSNA medals.Maui Coin Club is no longer an active organization to acquire these medals. HSNA was not provided the opportunity to acquire these medals. I obtained a working sample 2M-276 from Pressed Metal Products. This confirms that 2M-276 was a designed and struck by Pressed Metal Products. This fact is not mentioned in the 1991 Medcalf & Russell book. I prefer not to provide images of the letters of provenance at this time. Also, I have kept all email communications and letters/packages of the transactions. This provides further evidence of the authenticity of these 20 working sample medals.